Our native integration with NiceReply lets you bring customer feedback and surveys into your help desk. 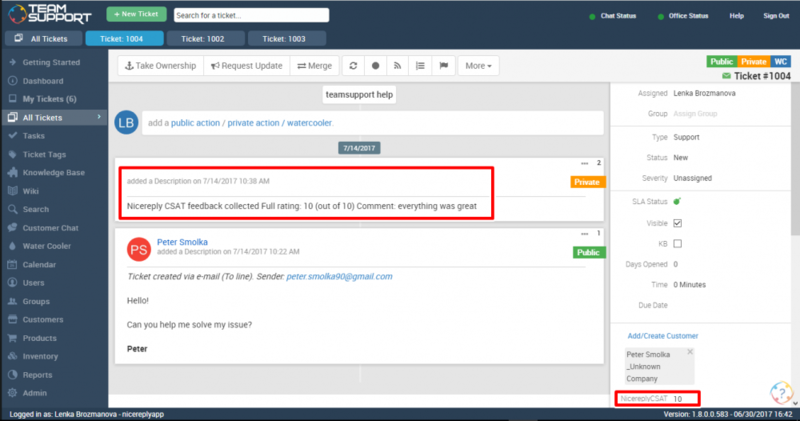 You can push ratings and comments into TeamSupport tickets as a note, and update custom fields with CSAT/CES/NPS ratings. The integration will also sync the customers name to the ratings in NiceReply. You can even set triggers in TeamSupport based on CSAT/CES/NPS value. All of the steps to integrate Nicereply with TeamSupport are done from within the Nicereply app. Please click here to visit Nicereply’s integration instruction page.